These 34 gallon perforated steel trash receptacles are available in variety of designer laser-cut slot patterns and selection of four lids options. A welcomed addition to any setting, matching park bench and backless bench are available. All five designer pattern bases, flat lid, weather shield lid, ash urn weather shield lid, and pedestal mounts are offered in polyester powder-coated (gloss & textured) finish, color options as shown. 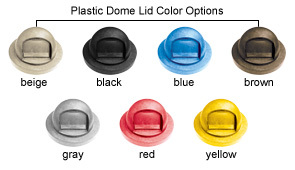 Plastic dome top lids are available in the colors as shown. (34 Gallon) Liners and (In-ground & Surface) pedestal mounts are sold separately. 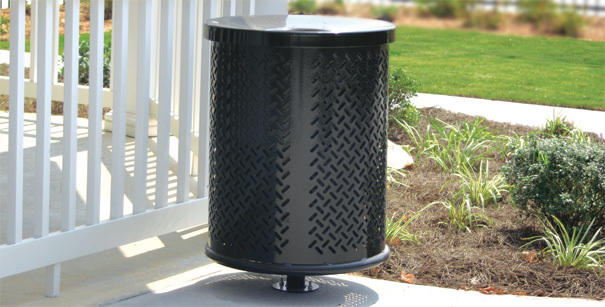 These perforated steel trash receptacles are available with several versatile options designed to suit your needs. To make your ordering process simple please follow the easy 3 step ordering process. Select Model (A, B, C, D, E or F) and Choose receptacle color. Select Model (G, H, I, J, K or L) and Choose lid color. 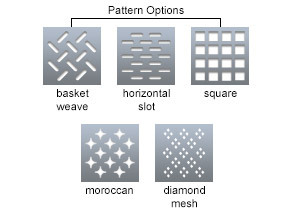 (M) Enter the Quantity of the complete perforated steel trash receptacle(s) you would like to order. Trash receptacle(s) base and lid will appear as separate line-items on the order form.